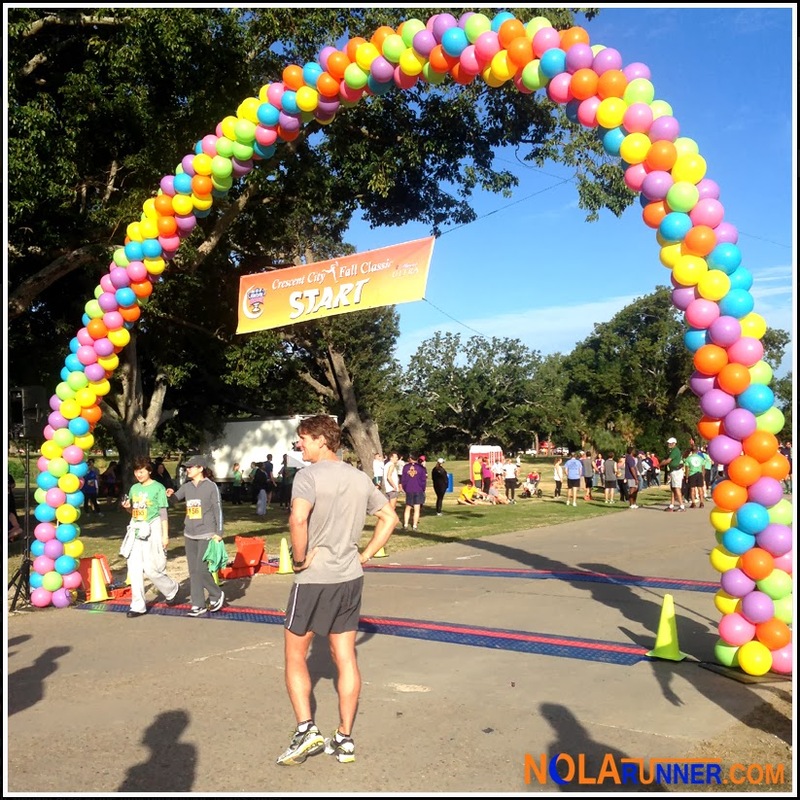 While I stand by my assertion that the Crescent City Fall Classic 5K is not just any other 3.1 mile race, I have to atone for other statements I erroneously made. Saying that it is the more mature counterpart to the Spring 10K race of the same name was more than a little off-base. Saturday morning was amazing, with clear skies and cool temperatures in City Park. Maneuvering in to place for parking was somewhat difficult with streets closed off early to secure the course, but that's a small price to pay for safety. A new starting line just north of the festival grounds was well marked with a rainbow of balloons welcoming the runners upon arrival. A trailer from Community Coffee provided runners with a pre-race jolt of caffeine, of which I considered having applied intravenously. The race started exactly on time at 8:30am, and followed a revised course from the one used during the years I previously participated. Capitalizing on newly developed areas of City Park, gone is the course that required runners to double back on a loop around themselves. Instead, much of the final miles on the Crescent City Classic 10K course is used. And unlike I said last week, there were indeed bands performing during the run, plenty of participants of all skill levels in attendance, and as my luck would have it, I was passed by runners in costume. Nothing reminds you that you aren't an elite runner more than having a participant dressed as a taco whizz by. 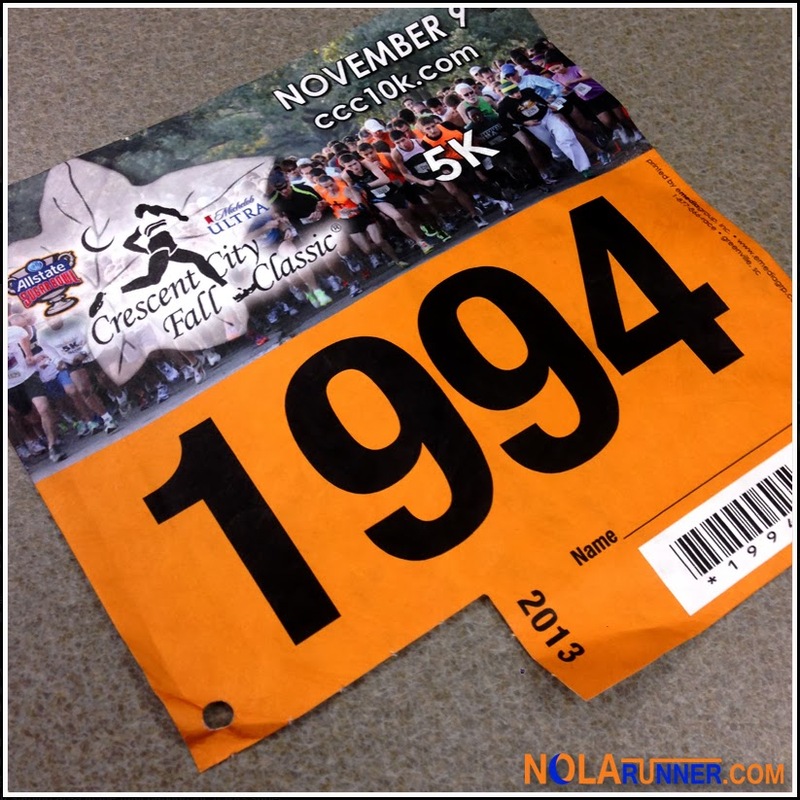 The Crescent City Fall Class is the only 5K race that can be used as a qualifier for seeding in top corrals at the Crescent City Classic 10K. The 22:00 minute minimum requirement is obtainable, however I knew I wasn't capable of hitting it in my current training condition. Many runners more than surpassed the pace needed on Saturday morning, but I was happy finishing just shy of 26 minutes. The weather and awesome course are more than suitable to make seeding well within my grasp in future years. Post race festivities and runner amenities made registration for the event worth every penny. Volunteers greeted runners at the finish line with commemorative sunglasses and bottled water, icy cold sports drink was on hand in coolers, and Michelob Ultra was freely flowing from a tap. Of course the Crescent City Classic staple, Blue Runner Red Beans, refueled runners after their run. The Stooges Brass Band performed on stage, and really cool fall colored glass awards were presented to the day's top finishers. 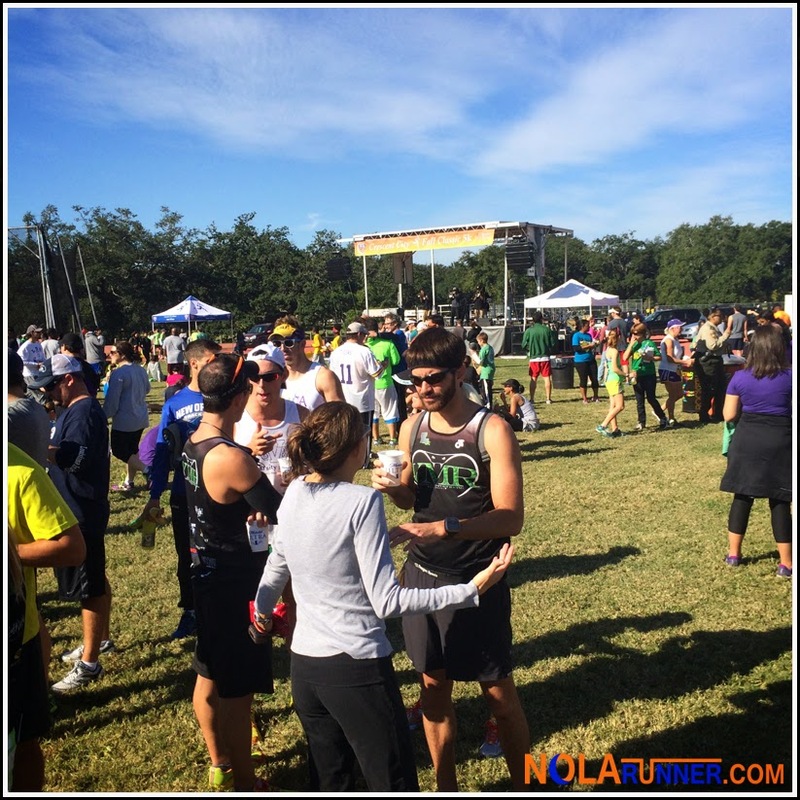 Check out more photos from the pre and post race festivities on the NOLArunner Facebook page HERE, and photos from the race and awards ceremony on the CCC Facebook page HERE. Like both pages to get more info on their upcoming holiday race in Celebration in the Oaks, and leading up to the CCC10K race in April. Looks like a great race, and much bigger than I thought it would be. NOTC seems to be putting on some great races these days. I need to check some out! Great job getting in another solid race. It was a great race, Katherine; however, this event isn't associated with NOTC. The Crescent City Fitness Foundation puts on this race, as well as the 10K, Bridge Run and Celebration in the Oaks fun run every year. But you're right, both this organization and the NOTC have both been putting on spectacular events recently. You do need to check one out soon!